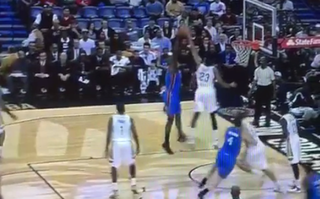 Kendrick Perkins Attempted To Post Up Anthony Davis. Try Not To Laugh. Kendrick Perkins is an anthropomorphic pumpjack that somebody taught to play basketball. Anthony Davis is an unofficial member of the Avengers. This is what happens when the former tries to shoot over the latter in the post. Let this moment be the NBA's answer to Sail Cat, and that ferret who totally thought he could make that jump. I don&apos;t want to spoil this for you, but he totally can&apos;t make that jump.